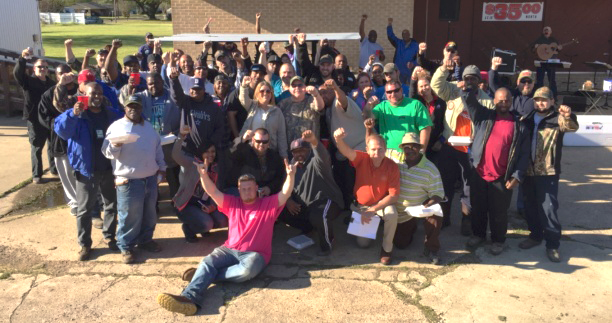 Local 2189 NFFE-IAM members at the Red River Army Depot in Texarkana TX, celebrated a recent victory in saving more than 700 jobs and preventing future layoffs due to the federal hiring freeze. NFFE-IAM Members who maintain and overhaul armored vehicles and equipment at the Red River Army Depot (RRAD) in Texarkana, TX have successfully fought for an exemption from the White House’s recent federal hiring freeze. Thanks to a decision by Defense Secretary James Mattis and Acting Army Secretary Robert Speer, more than 700 term/temp workers at RRAD, who were at risk of a March 4 layoff by the Department of Defense (DOD), know their jobs are extended. RRAD is vital to the success of soldiers and Marines who serve in high-risk deployments. The members’ work is critical to maintaining military readiness, which prompted Erwin to send a letter to Secretary Mattis last week that resulted in an approval for the nearly last-minute exemption on Friday evening. “We want to thank the members and staff in Congress who worked hard with us to save these jobs and preserve the future mission success of Red River,” said Erwin. “Everyone came together to get the job done. “This was a total team effort to support our members,” said IAM Government Employees Director Jim Price. The post More than 700 NFFE-IAM Jobs Saved at Red River Army Depot appeared first on IAMAW.